Moving away from your parents’ home into a dorm room is the first milestone of your adult life. Though exciting it is, it also comes with a lot of stress because living in a dorm means a lot of surprises and unpredictable situations. Dorm rooms are usually small, so you should take the advantage of every storage space. The spot under your bed is perfect for boxes and baskets, which you can use for anything you need to keep away. If you can raise your bed, you’ll be able to fit even bigger objects underneath. Students have a lot of devices and usually those come with wires or chargers. These cords have a tendency to get tangled and clutter the space, but you can solve this problem with binder clips. They will make all wires neat and quickly accessible. Continuing the topic of cords, it’s really annoying when you accidentally turn off a wrong appliance. To avoid this, put tags on each cord in a power strip. It can also be useful if you and your roommate have the same kind of chargers. Using candles in dorm rooms is forbidden and air fresheners are usually expensive. However, you can make your room smell fresh by putting dry washed sheets on the fan. The smell of your washing powder and softener will quickly fill the room. Another fan trick is useful for those hot summer days when a simple fan only makes the matters worse. Put a bottle with frozen water in front of it and you’ll increase the flow of cold air tremendously. This simple tip will save you and your roommates even on the hottest day. Drawers can turn into a mess in a blink of an eye, and you need to go through everything to find the right thing on the bottom. To avoid this, place clothes vertically. After having done this, you’ll clearly see everything that a drawer contains and will find the right thing easily. The gap between your bed and the wall can become a real black hole when you start dropping things in it. It’s always annoying to try to fish stuff out, so protect the space with a pool noodle. It costs almost nothing but will save you from a lot of pain. …but not in the shower. To avoid clutter in your desk and create more storage space, use them above your desk. If you feel like they belong only to the shower, decorate them to hide their true nature. 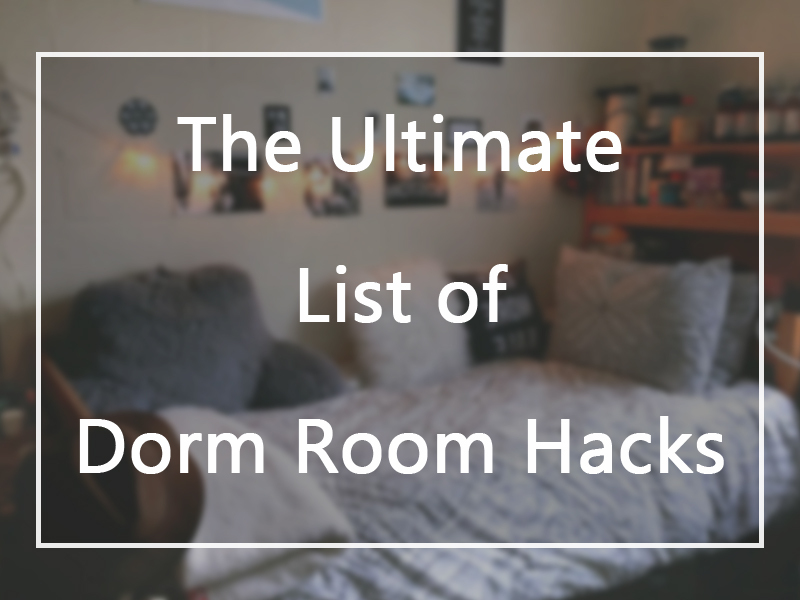 We hope these simple life hacks will make your life in a dorm room easier and more organized.